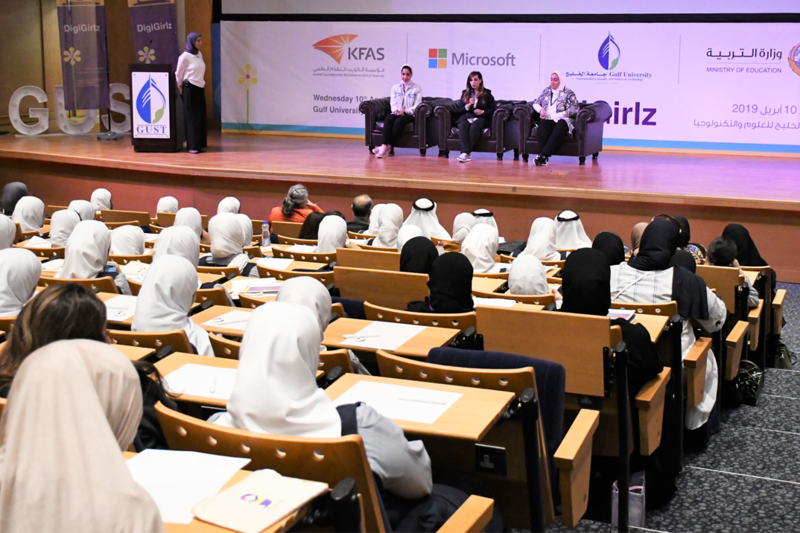 GUST’s Center for Teaching, Learning, and Research, collaborated with the Kuwait Foundation for the Advancement of Sciences (KFAS), Microsoft, and the Kuwait Ministry of Education, to host over 15 girls’ high schools on campus for the Microsoft DigiGirlz Program. The program is a digital skills program, aiming to inspire young women to pursue a career in technology. The event was attended by senior officials including GUST President, Professor Walid Bouhamra, Microsoft General Manager, Charles Nahas, and Dr. Salam Al-Ablani, KFAS Scientific Culture Director. The event welcomed a panel comprised of leading women in technology, including: Haya Al-Mana, Zain Kuwait’s Sustainability Manager, Noora Al-Askar, Founder of MyNutriBox App, and Arwa Al-Jaser, Founder of Mukkancom IT solutions company. The women all spoke about their journey in the field from how they started to how they succeeded. Students were then able to ask them questions about different aspects of z their experience. The program then gave students the opportunity to learn about careers in technology, connect with Microsoft employees, and participate in hands-on computer and technology workshops.